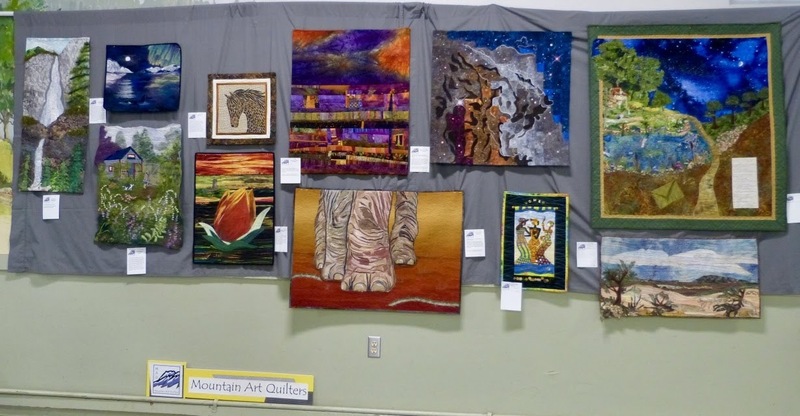 Once again this year, Mountain Art Quilters created a lovely display of art quilts at the local Pine Tree Quilt Show. In addition to our own display, members submitted a variety of quilts to the judged portion of the show and walked away with a number of ribbons. Congratulations to all our members who shared their work at the show and especially to those whose work was honored with a ribbon. 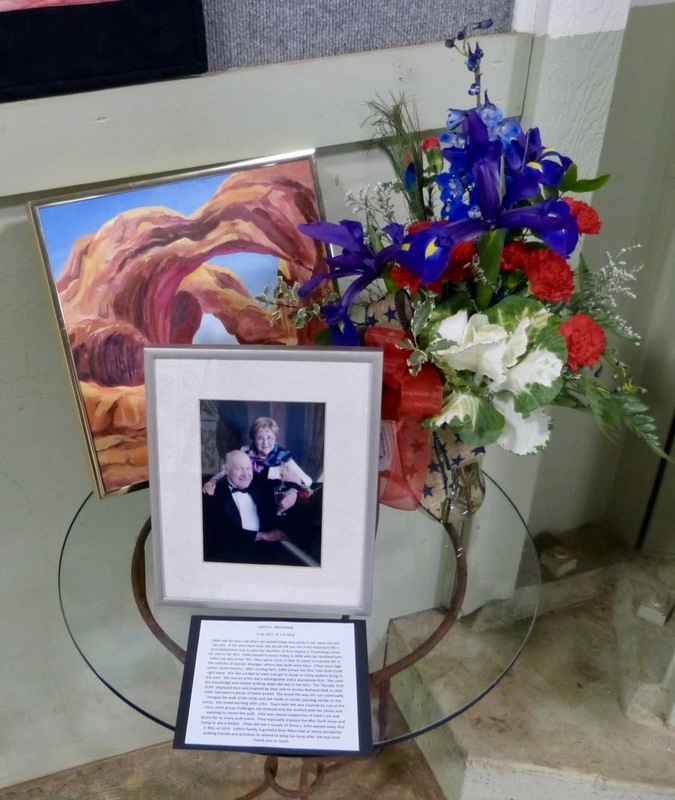 A special display honored Edith Gregersn who passed away earlier this year. Edith was a long time member of Mountain Art Quilters and an accomplished artists in many fields. Her sweet presence, her artistic flair, and her cheerful attitude will be missed. April was our first reveal of the year, and it was a very special one! 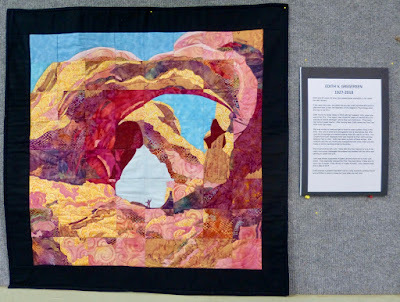 We had twelve quilts submitted for the three challenges: Fiber Fusion, Patterns in Nature, and Favorite Places. 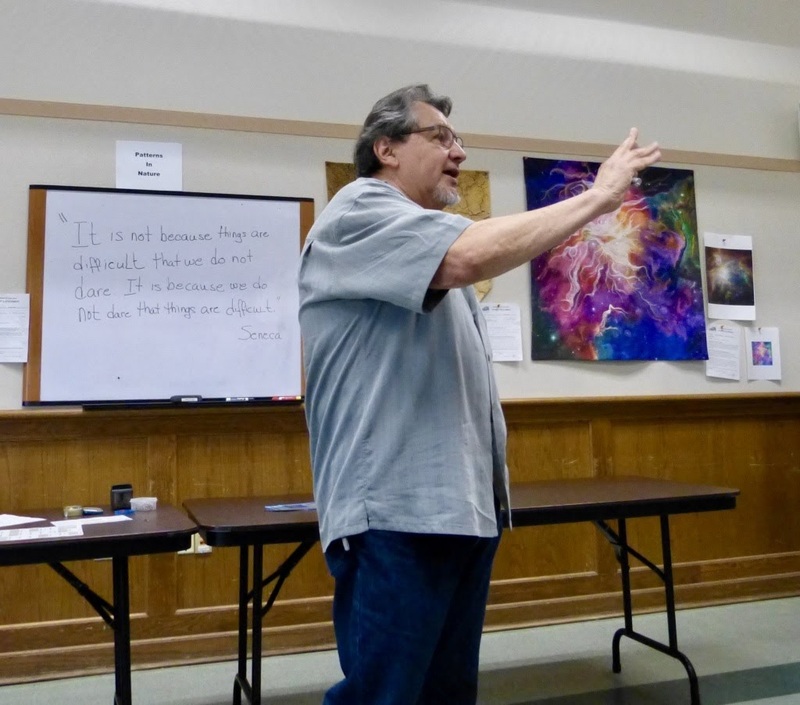 Our guest, Sierra College art professor Larry Ortiz, agreed to critique the quilts and offered a helpful perspective on artistic qualities. 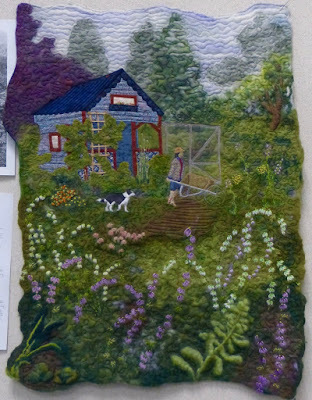 Linda's quilt was inspired by a photo of Colette O'Neill's garden in the west of Ireland (photo used with permission) and by the felt paintings of Moy MacKay. The background was wet felted on stabilizing paper. 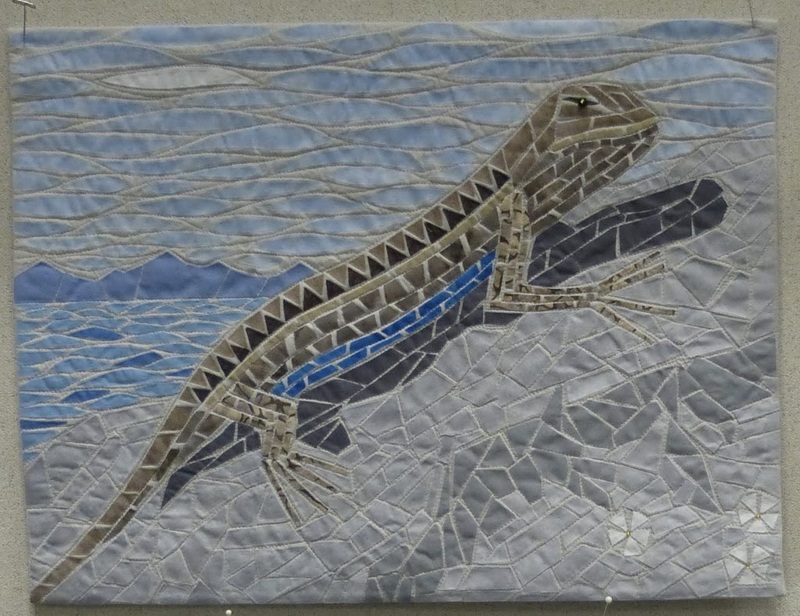 The quilt includes pieced and raw edge appliqué as well as hand embroidery. Linda says that the wool was snipped rather than drafted, creating a less directional effect, tacked down with needle felting, then wet felted using the dryer method. Linda loves working with wool and hopes to continue experimenting with this medium. Iggy is an iguana that Sophia photographed in Costa Rica. 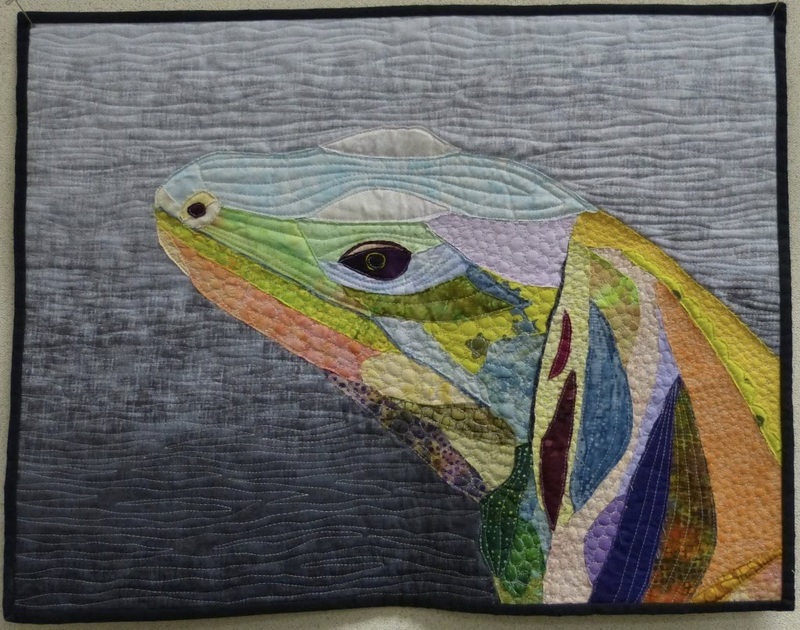 She was captivated by his scales and by the great shading which made him a perfect subject for the class by Lynne Pillus, "Color Doesn't Matter," that focused on values. Sophia used mostly commercial fabrics group into seven value groups. The batting is Warm and Natural; quilting was done with Aurifil thread on top and monofilament in the bobbin. Sophia used a black and white photo to help group the fabrics. She found it very freeing to just reach into a value bag and pick whatever fabric was on top. She did do some color adjusting after looking at it on a design wall. She found the quilting to be a challenge and feels this is an area where she needs more work. Sophia says that this quilt could have fit the "Favorite Places" theme as the trip to Costa Rica was the first vacation she took with her daughter as an adult. Sophia had a fabulous time! Kate was intrigued by the patterns of scales on lizards, the patterns of the phlox petals, and the patterns in weather -- how one cloud can herald many. She used a fabric mosaic technique using Wonder Under on the background (grout) fabric and a top layer of tulle. She used cotton fabric, batting and thread. The lizard has an extra layer of batting to create dimension. Kate quilted with monofilament thread and used beads to embellish the eye and centers of the flowers. Kate found that by changing the color of the mountains from green to blue, she changed the mood of the quilt. Kate tells us that she loves lizards -- their blue bellies, the way they do push-ups, and the fact that they help fight lyme disease. Jan says, "The progression of color changes signal the time for a plant to take a seasonal rest and this could be likened to the changes that we women 'of a certain age' experience. The red could represent hot flashes, the golds the treasured moments with family and friends, the browns the parts of our bodies that begin to tell us they're wearing out. (sigh . 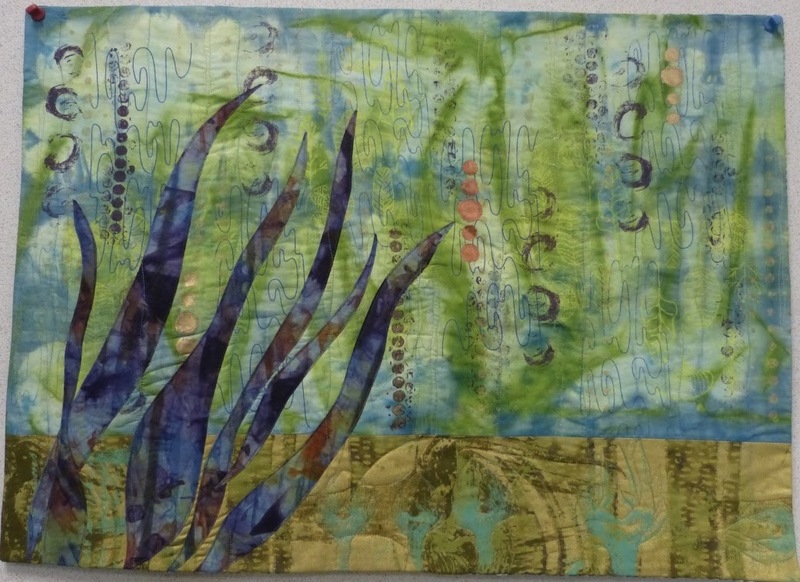 . .)" Jan used commercial batiks, commercial wool yarn, monofilament and regular thread, colored pencils, double piped binding. 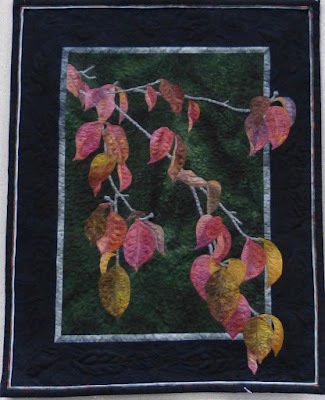 Jan continues to be fascinated by the structure of trees and the endless patterns of leaf shapes and colors. This branch outside her window has been asking for a quilt for a couple of years now. Patty's inspiration was a face she saw in large leaves in a store in Iowa years ago. She was drawn to that face and decided to recreate it in a quilt. 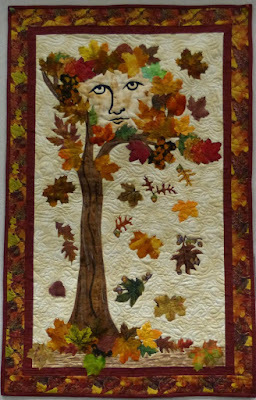 Patty rust-dyed the fabric for the face and cut the leaves from a variety of fabrics. She painted the 'dirt' at the bottom of the quilt and used crayons on the trunk. She used bamboo batting. 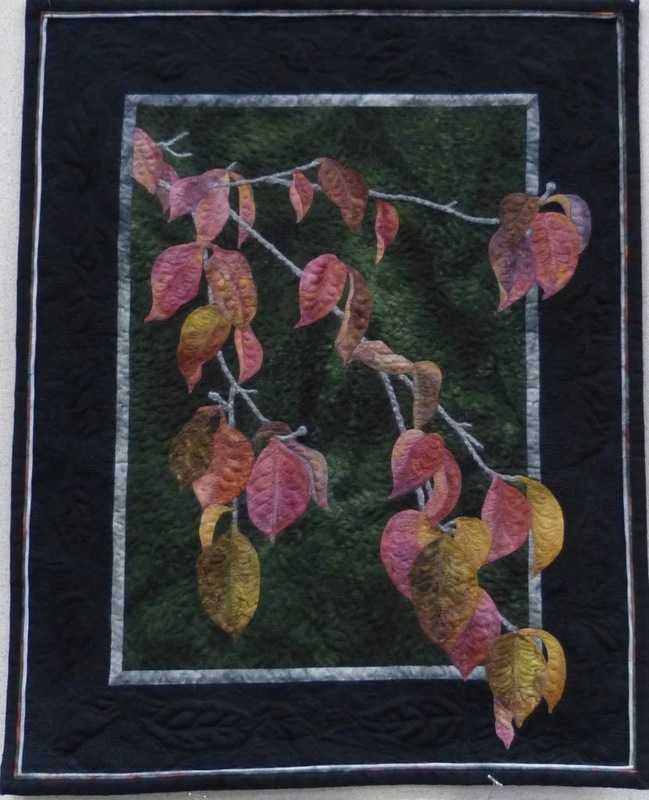 The quilting was her biggest challenge and she ended up using a swirling stitch to look like the wind blowing the leaves. Sig was inspired by the fabric preparation which reminded her of a dry lake bed like those one sees in Death Valley. Sig started with bleached muslin and a flour and water resist. 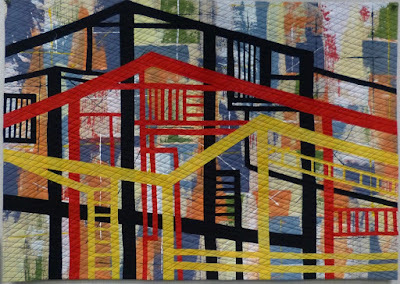 She used black paint, dye, paint sticks, cotton thread, wool batting and embroidery thread. This was a creative opportunity for Sig. Last summer, she took advantage of the weather to do several pieces of fabric prepared outdoors. She discovered that the flour water paste placed in direct sun dried with this big pattern of cracks. 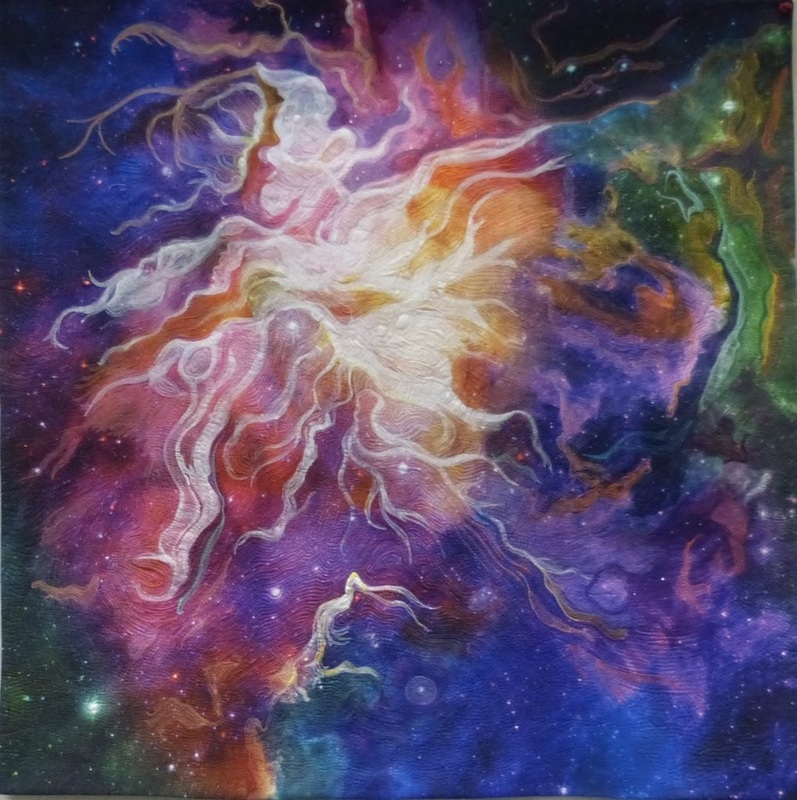 Robin's quilt was inspired by a deep space image of the Orion Nebula from the Hubble telescope. It is a stellar nursery where new stare are born in the glorious colors of the primordial gasses in the constellation of Orion, one of her favorite winter sky objects. She chose the nebula for the patterns in the colors and the streamers of gaseous light. This is a whole cloth quilt with an Artisan Spirit Expressions panel for the background. Robin enhanced the image with fabric paints and dyes, and heavy thread painting in colors complementing the subject for texture and design. Robin says she is continuing to explore deep space subjects for her MAQ challenges and plans to continue creating her own whole cloth designs. Sig's favorite places are the Nevada Museum of Art represented by the black lines, her studio, represented by the red lines, and her local library which is represented in yellow. She started with bleached muslin and applied a background using acrylic paint with a scraper. The red and yellow lines are hand-dyed fabrics while the black is a commercial fabric, all applied using raw edge appliqué. The batting is wool and the piece is hand-quilted. Sig is attracted to layers an lines. She's done two other, larger pieces in this style but more abstract. This is her attempt at something more architectural. 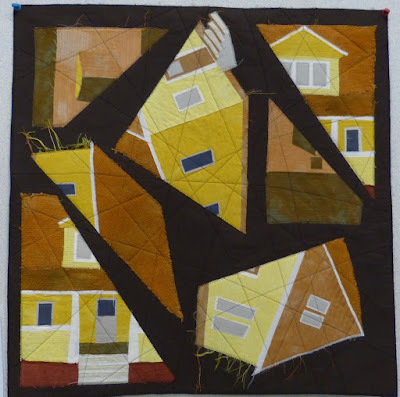 Jackie's inspiration was her grandparents' house re-created in a cubist fashion. The fabrics are hand-dyed with a cotton background and backing, and felt as the batting. Jackie has been intrigued for years by a description of cubism as seeing all sides simultaneously. For some reason, her grandparents' house became the subject. She created three views -- front, from a corner showing two of the sides, and from above the roof. She had no idea how to proceed but as she persisted, things came together and she is pleased with the result. 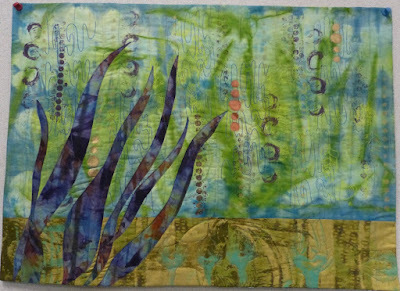 "Ideas Swimming in My Head"
Ann started with a piece of fabric that she had discharged. It looked water-like, so she continued with that theme. She incorporated cotton fabric that she hand-dyed or discharged using bleach, as well as several designs she printed using a thermofax. 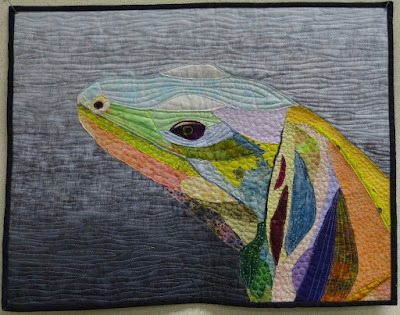 She embellished the piece with thread play using variegated and metallic threads. Ann chose the category "Favorite Places" because she loves the ocean and snorkeling. 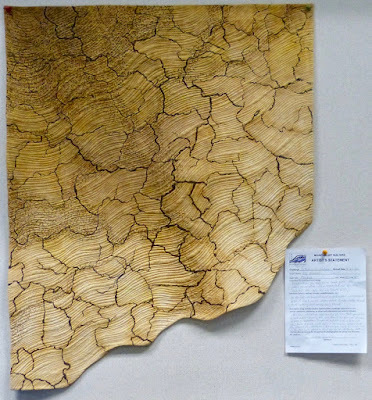 Ardy felt the need to honor Nevada county, the place she chose to live 23 years ago. She used commercial fabrics, Jacquard fabric, inkjet printer sheets and a wool batting. Ardy's quilt was made to honor her country and her county (Nevada county, the most beautiful place she knows). The lyrics to "America the Beautiful" were printed on commercial red fabric stiffened with Terial Magic. 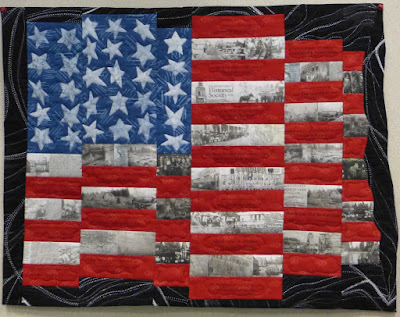 The "white" stripes are all old photos taken in Nevada county and printed on Jacquard fabric sheets. The stars are stenciled. 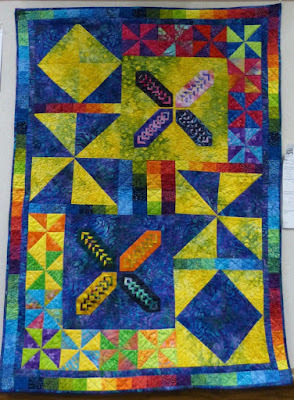 The quilting was done with Superior glitter thread. According to Ardy, the most challenging part was making the photos fit the 2" wide stripes. 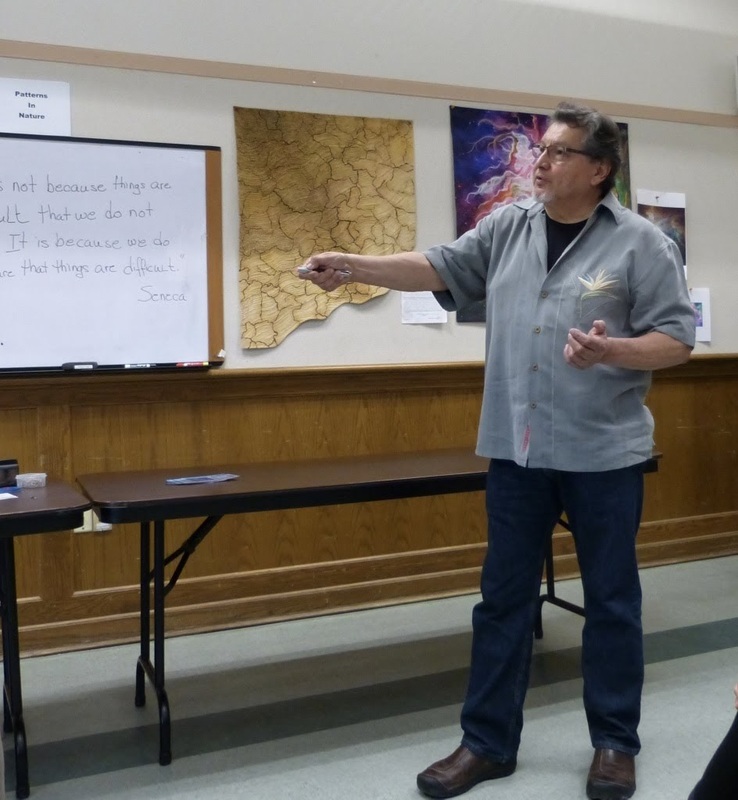 Our guest, Professor Larry Ortiz of Sierra College, critiqued the quilts for Mountain Art Quilters. He drew attention to places where perspective could have been improved by using different color choices or size variations, to focal points (or the lack thereof), and to highlights and shadows that could be used to indicate light sources and direction. 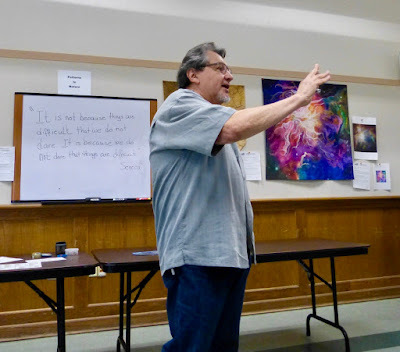 We all appreciated his expertise and the artistic perspective he offered. He has a standing invitation to attend any of our future reveals and a promise that he won't be put on the spot again. We all agreed that it was a very productive, informative reveal and we are looking forward to the next one in July! Sharon was inspired by the colors in the Celtic motif block elements that she acquired at a quilter's estate sale. She used cotton fabrics and channeled her inner Freddy Moran while stepping outside her comfort area with bold colors.